Durable Medical Supplies can now be created as SMARText Items and printed or faxed from the Rx Manager. In this lesson we are going to create a prescription for Lancets. Click on Docutainers on the menu bar. 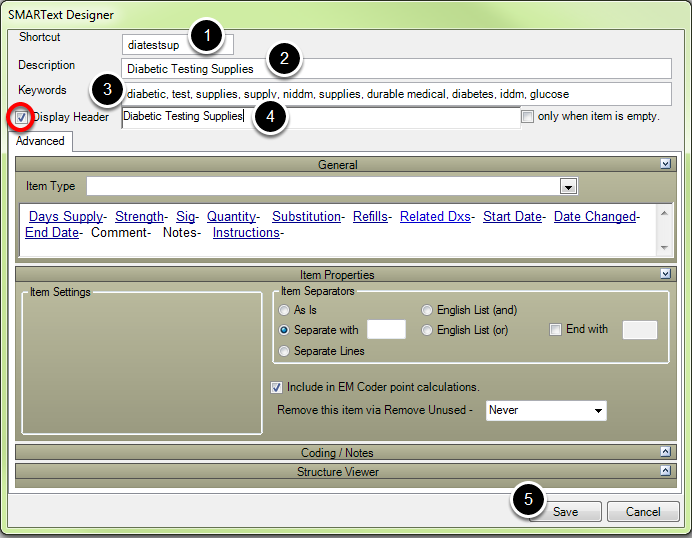 Click on the Create (green +) button to create a Medication Item. 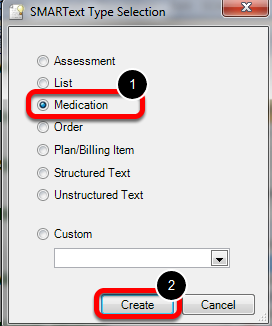 Select the Medication radio button. *Note: this should only be done when creating DME Items. Prescription medications should be duplicated and then edited. Please see: Creating SMARText Items in the SMARText Items Manager. 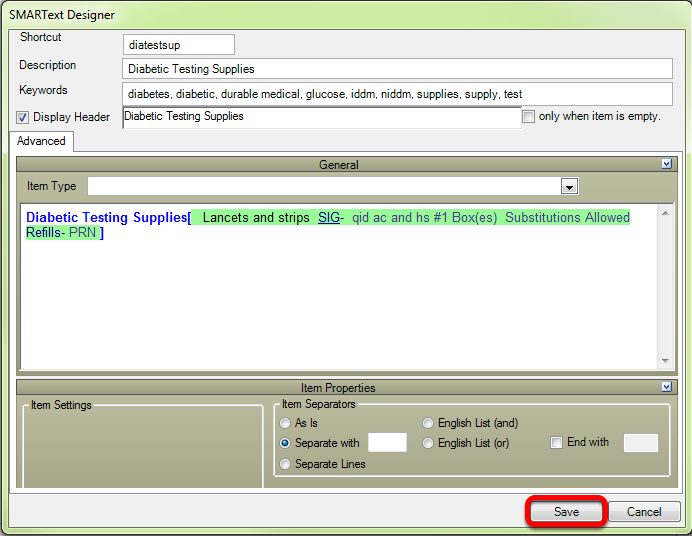 Click the check box next to Display Header and enter "Diabetic Testing Supplies" (or your preferred display header). Click the Save button to save your newly created item. This step is necessary before adding in the strength, SIG, etc. See the steps below to add this detail. Search and edit your newly created item to edit the details. Enter the shortcut code to search for the item. Left-click on Strength to bring up the Item Comment box. 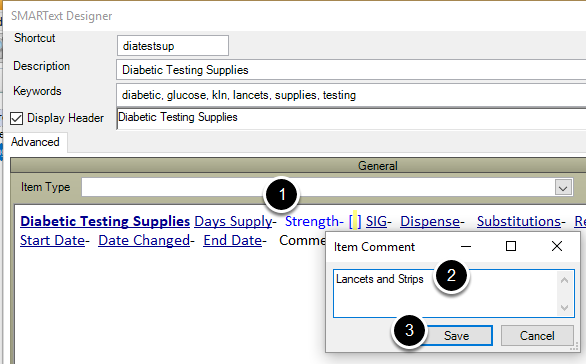 Type in the Item Comment box "Lancets and Strips." Click on the SIG- header. Create a new SIG by clicking in the blank SIG line in the SMART Quick Access and enter your preferred SIG. Click on the Empty SIG line to save the newly created SIG. Click on the SIG created to insert this into the SMARText item. Fill in the Dispense number, Substitutions, and Refills by clicking on each item and selecting the appropriate option from the SMARText Quick Access window. 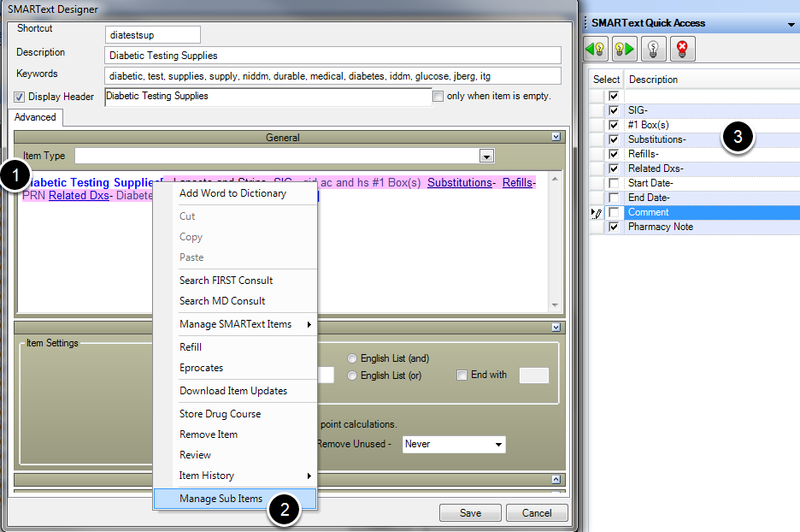 The SMARText item will have sub items associated with a medication. Right-click over the SMARText header. Users are to un-check items he/she does not wish to display on the prescription such as: Start Date and End Date, Comments. Complete the item and ensure that the item looks as it should be prescribed. In the Medication field of the SOAP Note, enter the shortcut, followed by the space bar. Right-click on the Item Header. 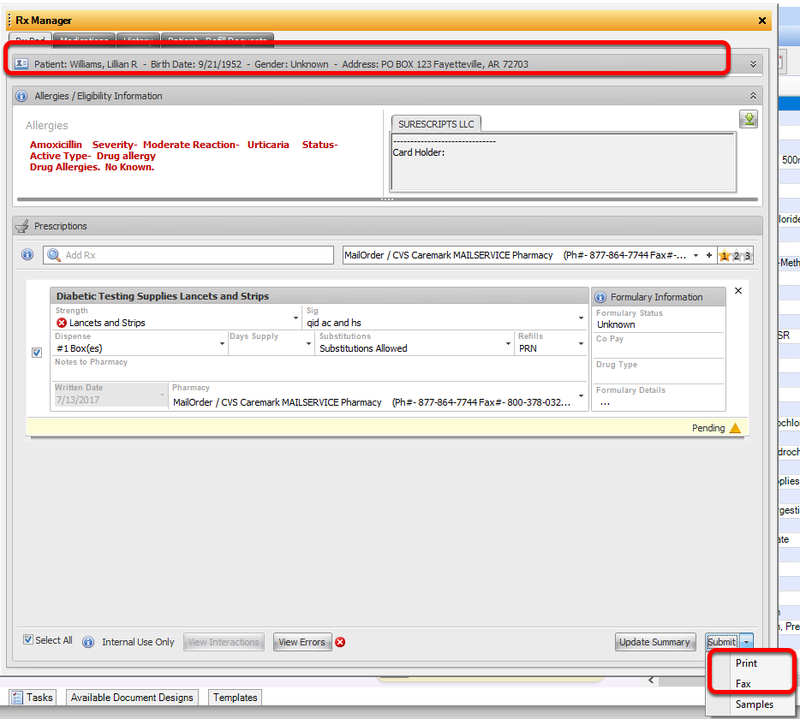 Check "Related Dxs" in the SMARText Quick Access. *Note: In the Default Layout (Tools > Options > Structured Rx) if the user has Related Diagnosis checked, this will automatically display Related Diagnosis and the user will not need this step. 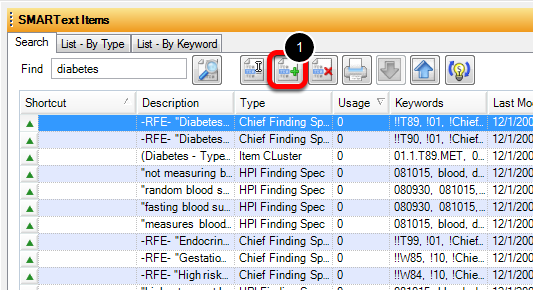 Press the F8 key on the keyboard ( or right-click over the Medication field header and choose Rx Manager) to bring up the Rx Manager. You will receive an error under "View Errors" that states that the strength cannot be e-prescribed. You will need to Print or Fax the prescription. Click on the drop-down arrow next to the Submit button. The item has now been either faxed to the pharmacy or printed. 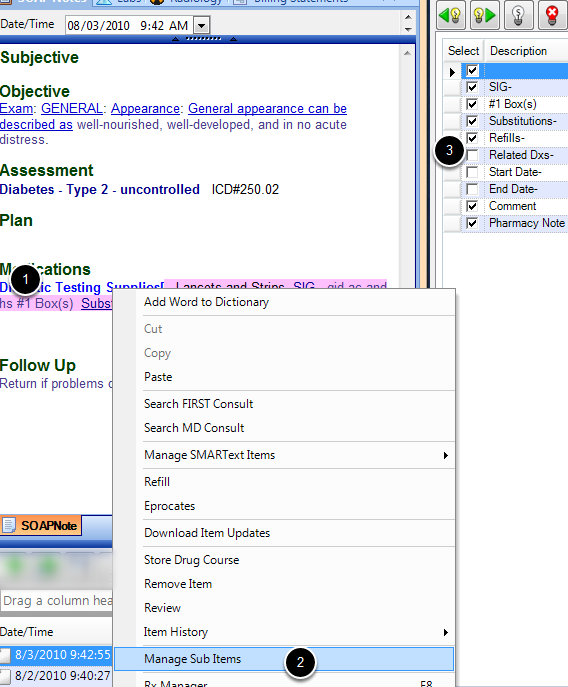 The prescription will now display in the History tab of the Rx Manager.